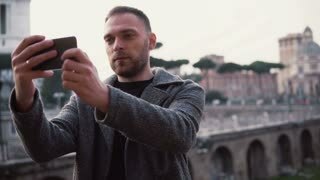 Handsome man with a beard exploring new city, taking photos of city on smartphone. Guy have vacation in Rome, Italy. 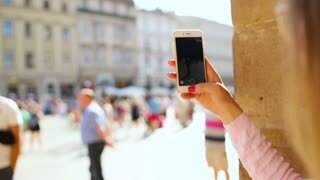 Man tourist explores new city, takes selfie photos of city centre on the smartphone. Male enjoys trip to Rome, Italy. Young woman using smartphone while exploring the Roman Forum. 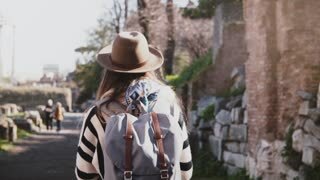 Girl walking in city, spending vacation in Rome, Italy. 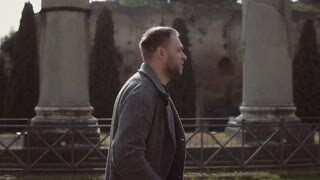 Handsome man walks on ruins of Rome, Italy. Guy does up hair, explores the architecture of Roman forum. Slow motion. 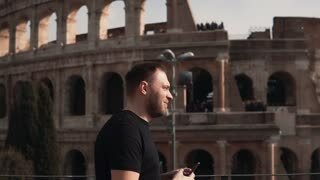 Middle-aged handsome man watches pictures, takes photo in Rome, Italy, smiling, exploring new city. Slow motion. 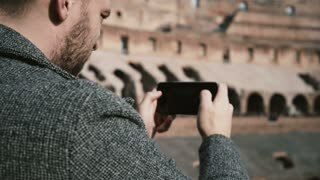 Handsome male with walks at the Colosseum in Rome in Italy, taking smartphone, exploring the country. Slow motion. 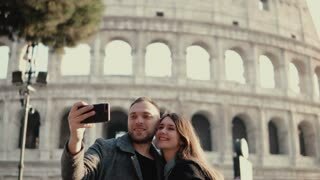 Happy smiling senior European man taking smartphone photo of Rome, Italy on retirement vacation trip slow motion.